I have come to accept it, and I’m sure there are people out there refusing to talk about it. Especially since last year it became a $1 billion industry, and could be worth $2.38 billion by the time 2019 hits. But while the influencer industry looks promising, there are some truths we need to acknowledge for it to remain so. Think of how much money companies can save now by advertising with independent influencers. Their cost for running ads with services before the time of influencers included magazines, celebrities, commercials, billboards, street signs, etc. Influencers now offer not only more content than brands ever had a need for before, but a new, more intuitive kind of promotion. Less broad, and more acute/niche specific. 1. More influencers equals more competition. (I suppose we saw this coming…) It’s harder for influencers to be found, or stand out from others just like them. What can one offer that the thousands of others don’t? Why should a company choose to work with them over the others? Countless look-a-like bloggers are literally clogging the pipes here, making the stream of work pretty stagnant for mostly everyone. 2. More NEW influencers mean more opportunities for brands to get free advertising. Why would a company pay thousands of dollars to one influencer, when they can just send free product to 20 small/new influencers who’s followings would add up to the same number as one big influencer? And the only cost to the brand? Probably less than $500 in cost it took to make their product (depending on what brand and the value of their products). But most brands probably spend on average about $13 in production per product. $13 x 20 influencers = $260. Add in shipping and packaging. This is still nothing compared to what influencers of 100k+ should be making per post. 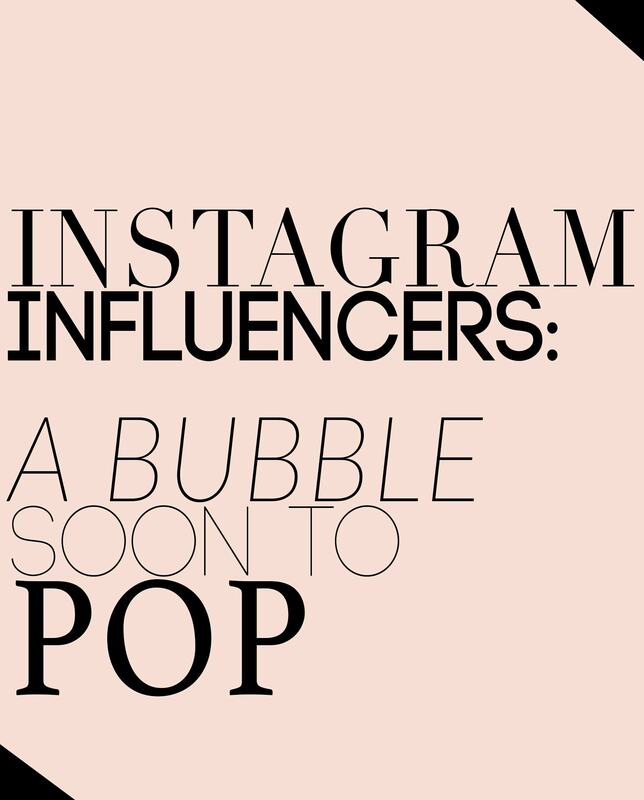 The brand’s goal is to not spend money, and smaller/new influencers are enabling this. 3. Bigger influencers are losing job opportunities. This is leaving brands expecting free work from everyone, because they can get it easily from small influencers. Now, everyone had to start by working for free, so it’s not really the influencer’s fault. But if the bigger influencers start having to leave the industry, only small bloggers will be left… sounds like a good thing for the small bloggers? 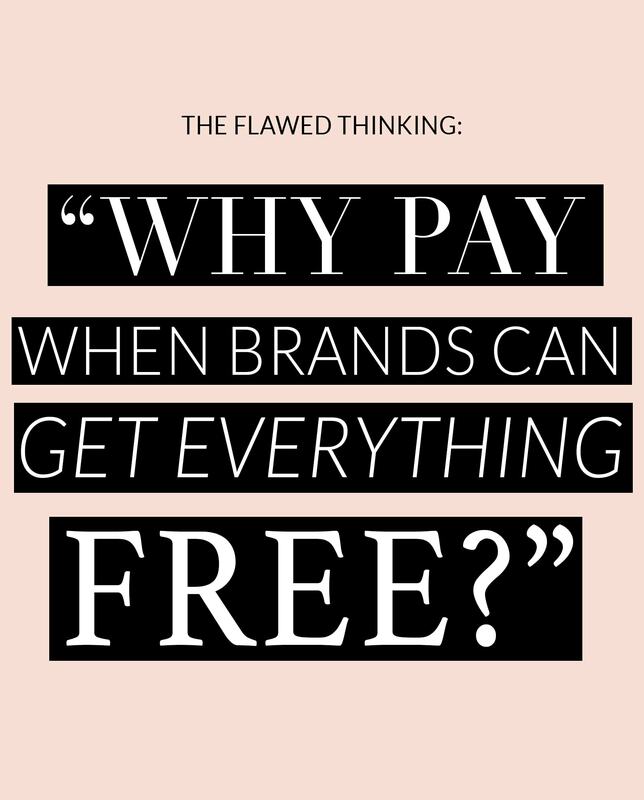 Well not really when they’re stuck with brands that will only expect free work. Because now the system is broken. I don’t know about you, but when I got going (even part-time) with this work, I had to start charging. Because of the amount of time and work and money it took to create content daily. That is all of value, and brands know this. (Heck, otherwise they’d be doing it all their self!) Which is why they are all the more keen to convince you otherwise. Why pay when they can get everything free? Please listen up. You are only helping to promote them so they can make sales, so why shouldn’t the influencer be making money too? You have to realize, if they are trying to collaborate with you, it’s because they can benefit from you. So… what is actually fair for both parties? It certainly shouldn’t be one-sided. Even if you aren’t offering a huge audience, you must be offering quality content! Do you know what your value is? If the big influencers start to bail, and only small influencers are left, how long will they want to keep working for free in this broken system? We all know they got into this line of work for the hope of success, for the promise of good income and rare opportunities. But when those things aren’t given, what then? This is when it’ll all come crumbling down. And when the influencer market is dead, how will the brands find their audiences and potential sales now? Especially new brands who’ve started up at the gleaming prospect of success thanks to Instagram marketing? It’ll not only cause a loss of jobs for these influencers, but also for many independent brands and designers. People who might not have even started their brand if not for seeing the potential in influencer marketing. Could these brands even survive if they weren’t piggy-backing off the content and exposure of social media public figures? Think of all the money being saved in photography & model fees, location/destination shoots, ads, etc! The truth of the matter is maybe these small/new brands actually can’t afford to pay influencers. Which means they couldn’t afford to pay for advertising either. They only started their brand at the prospect of free advertising. But if influencers went away, where would they be? Should they have even started their business in the first place, if they can’t/won’t pay for advertising? Were their intentions corrupt, greedy, or just naive from the onset? So what can be done about this? How can we stop the seemingly unavoidable crash of a once (though sort of short-lived) promising industry? Again, not all fault lies with the influencers, though both parties need to get educated and wisen up. 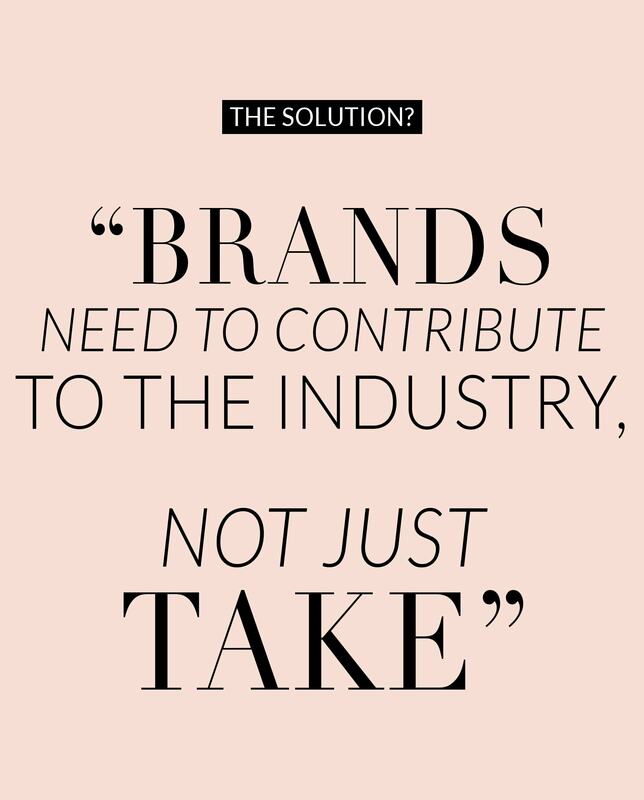 But I think what is important is that brands need to contribute to the industry, not just take, if they want it to be around to benefit their companies in the future. Like the Newspaper industry that is failing. Most people can and now expect to get their news for free. And the longer people get something for free, the less willing they are to pay for it. Hence why local newspapers are the first to be shut down, and many employees laid off for their paper not meeting profit margins. It’s not that people may not pay for local news, it’s that local papers have declined in quality at the greed of their owners. The greed of the owners being their need to make higher profits to maintain their lifestyle, at the expense of the employees wages. Jobs are cut to maintain this. Does this sound at all similar? Brands expecting to pay nothing, and greedily make their profits while offering little to nothing to the influencers. They have already started cutting out paying influencers (like cutting jobs of talented journalists) and lower the overall quality of the industry, by only inflating the part of it that encourages influencers to work for free. And there can and never will be lasting quality of work with no pay. So, I’m scared for this industry, and I think it smart to take this food for thought as a strong warning. To influencers, brands, companies, and agencies alike. Something has to change, and NOW, if we are to prevent this shining star from burning fast and burning out. And… to those of us influencers… as the saying goes: one should never put all their eggs in one basket. Who knows how stable that basket really is. As an insider in this industry, I have an on-going discussion about the issues I’m coming up against. I’m sure you relate! Read “Vanity, Negativity, & Imitation: The ‘Art’ of Instagram” for more!